I’ve been working on putting out some flowers to give a little curb appeal to my home and to just make things feel like spring. Especially since spring took so long to get here this year. I was looking for different ideas on what to do for flower containers outside, as I don’t want to invest a lot of money into expensive planters, but I still want something that looks nice. Well, I came across a neat idea on a blog called Life in a Little Red Farmhouse. The writer of this blog took some bright red feed buckets and planted flowers in them. So, I love this idea! Even if I bought new feed buckets, it is still more affordable than buying the window boxes, and the feed buckets will hang off of my porch railing easier. 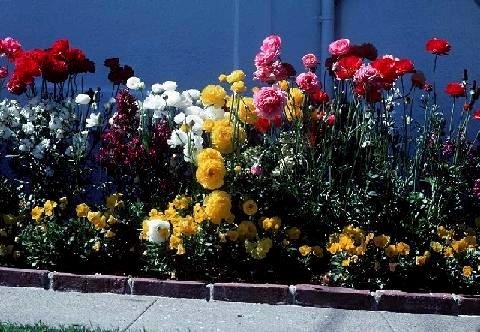 I’m also wanting to do something different with the flowerbed on the side of my walkway up to the house from the driveway. The flowers are pretty, but they aren’t very organized, it looks like a hot mess of exploded color. My steps on my front porch are nice and wide, so I’m thinking about getting some small metal pails to use as flower pots and have a different type of flower for each step, maybe do a rainbow effect going up. 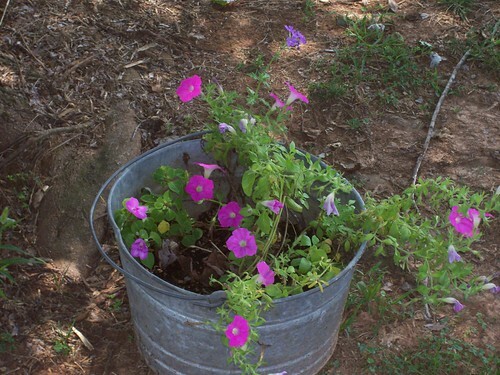 Ah, I just love the look of flower growing in a bucket. And in a wheel barrow, I think I may have to go through the barn and see what all I have that can double as a planter for my flowers.